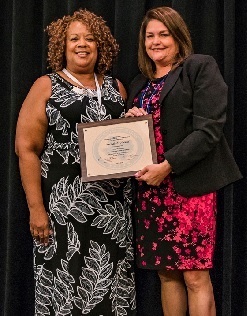 The 2018 Texas Chapter of International Public Management Association for Human Resources Presidents Award is the Human Resources Department for the City of Arlington. HR Director is Kari Zika accepted the award on behalf of City of Arlington at the Annual Conference. 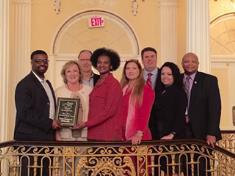 During the recent IPMA-HR Southern Region Conference held I Memphis, Tennessee, the IPMA-HR Texas Chapter was selected as the chapter of the year! There were 11 other chapters that could have also been awarded this designation (Alabama, Arkansas, Florida, Georgia, Kentucky, Louisiana, North Carolina, Oklahoma, South Caroline, Tennessee, and Virginia). On behalf of the Board of Directors and all of the members and supporters, we thank each of you for your contributions in making us the Chapter of the Year! I hope you continue to find out intergovernmental alliance among Public Sector HR professionals a valuable source of professional and career development. Congratulations to our Texas chapter president, Mark Washington, for being appointed to Assistant City Manager for the City of Austin. Also congratulations to fellow chapter member, Joya Hayes, as she has been appointed to Human Resources Director for the City of Austin. We are excited for you both and wish you all the best! To learn more about their accomplishment, please read the City Manager’s Letter for Mark Washington and Joya Hayes. Congratulations to chapter member, Jane Cheeks, for being promoted to HR Director for the City of Houston. To read more about Jane’s accomplishment and her new position, please visit the City of Houston’s official website. We would like to know about all of your accomplishments! In order to submit an award that either an individual or organization has received, please send the award name, the recipients’ name, a picture (if applicable), and a brief blurb about the award to Kalia McKinley at [email protected].